“In these selfish, sexual and demonic days, young minds find it hard to concentrate, cyan (can’t) meditate, confused, drowning in electro waves/in everything there is good and bad but everything in due time and due season, which is the reason I say there’ll come a time to sing a brand new song, there’ll be A Better Tomorrow.”-Etana, Spoken Soul intro from “A Better Tomorrow”. She chose the name Etana, which means ‘the strong one’ in Swahili; her strength was manifested, this time around, by pursuing a musical career strictly on her own terms. Her elegantly modest Rasta-chic sartorial style is as distinctive as her sound: an audacious fusion of folk, soul, jazz and reggae supporting a powerful vocal range suggestive of the ancestral spirit of South Africa’s Miriam Makeba, the regality of reggae queen Marcia Griffiths and the soulful verve of Etta James. “I looked at how women were being represented in (Jamaican) music and how little girls think that is the way it is supposed to be, and I wanted to be a positive influence and change some of the things they are taught,” Etana reflected. Ever since the release of her first single in 2007, “Wrong Address”, which highlights the discrimination faced by some Jamaicans living in violence-plagued communities, followed by “Roots”, which cautions the younger generation to maintain their culture (“you cyan water down and dilute, you cyan hide the truth from the youths”) Etana has consistently wrapped encouraging and edifying sentiments in gorgeous melodies and lushly textured rhythms. Her debut album for VP Records “The Strong One” was released in 2008 to extensive acclaim while her sophomore album “Free Expressions” including her deeply emotional rendering on “Free”, broadened her fan base. On February 26th VP Records will release Etana’s third set “A Better Tomorrow”; recorded at Kingston’s legendary Tuff Gong Studios, it is her most confident and cohesive work to date. “I wanted this album to feel like a concert performance and have everything go together, like chapters in a book, with all of the tracks played live by musicians (not digitally generated),” Etana explained. Producer Shane C. Brown of Kingston’s Juke Boxx Productions brilliantly executes her vision. Brown has recently attracted widespread recognition for his contemporary roots reggae productions including Busy Signal’s “Reggae Music Again”, the only reggae title listed on the BBC Music Critics Top 25 Albums for 2012, ranked at no. 7. Positive vibrations infuse each of the album’s tracks. “Smile”, for example, conveys quiet strength through its sparse, piano-dominated sound-scape and Etana’s subdued vocalising. “Beautiful Day” offers images of serenity, underscored by fluttering sax phrases by the incomparable Dean Fraser; “Whole New World” celebrates “a new side of me, open to new possibilities” and “Queen” is a one-drop tribute to “the striving, struggling hard working women in the concrete jungle, telling them to stay focused on their goals.” Etana’s stirring delivery on “Strongest” reminds us “only the strongest of the strongest will survive, to get to Zion you need a will, you need a drive”. Lamont Savory weaves cheerful guitar lines throughout the irresistible “All I Need”, written while on the road in Europe where Etana longed for Jamaica’s food, climate and especially its music, requiring “the sound of Dennis Brown, a little riff from Jimmy Cliff, Beres rock me away”. A stunning, seductively crooned ode to the island’s signature beat punctuated by dub reverb effects, “Reggae” (co-produced by Stanley “Rellee” Hayden for A Team Productions) was initially included on VP’s Reggae Gold 2012 compilation and as the title track to her digital three-song EP, released in November. The song has become so popular, Etana now closes her concerts with it, earning overwhelming responses from audiences who readily sing along to “Reggae’s” alluring call and response chorus: “hit me like a drum, play chords and I will strum, sing out and I will come cause reggae you’re the one”. “The first time we performed that song was in Spain at the Rototom (Reggae) Festival (in August 2012) before thousands of people and when we got to the chorus people started singing as if they knew it a long time ago so we spent five minutes or more performing it,” Etana recalled. Musical love is often unconditional; relationships between people are far more complicated, a theme explored on “4 Play 2 Love (Start Over)”, as a former couple, each now involved with other people yet still carrying strong feelings for one another, contemplate another try: “my new man loves me, he loves to call me wife but I can’t imagine living without you in my life, let’s start over”. In real life she is married to Andre Morris and they have an infant daughter Nyla, who was born in November 2012. “Til You Get Old” is Etana’s moving pledge of love to her child, the song’s ambient tone and overdubbed effects including the sounds of a baby being born contribute to its mystical quality. “I found out about a month after we started recording this album that I was pregnant, so all that emotion and energy went into the album,” Etana shared. Offering praises to the Most High, Jah for His continual guidance is the gospel-reggae tinged “The Prayer”. The song’s lyrics also summarise the singer’s triumph in successfully navigating her musical journey, while encouraging the listener to summon their own power. “I will never surrender though they try to do me wrong, let the weak say I am strong/there’s a road you got to travel, many dangers up ahead, we can never be defeated, don’t you be afraid.” “It is still much harder for female artists to receive equal treatment,” The Strong One states. “Some promoters think women should be paid less and given less time onstage because they think they don’t have an audience so I always have to prove myself again and again and again.” With the spectacular singing songwriting and performance skills showcased on “A Better Tomorrow” it’s unlikely further proof will be required. 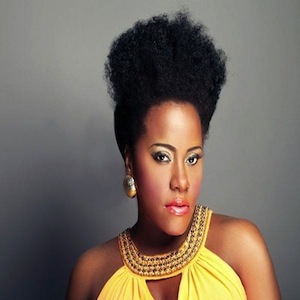 Win one of Etana's albums for free.